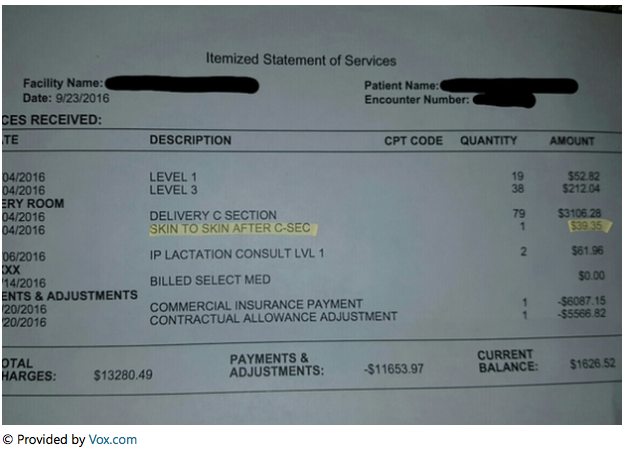 When the parents of a precious little newborn child received their hospital bill for the baby's delivery they noticed a small, but odd fee of $39.95 for a service labeled "Skin to Skin After Sec[tion]" aka "Mother holding her child after delivery". It's a known fact that any service at a hospital comes with extreme, and oftentimes unnecessary costs. 2 Ibuprofens can run you 50X the cost that it would from a drugstore. And I get it; hospitals have huge overhead costs and profits must be made (especially when your talking about the American Healthcare system, right? ), but a charge to hold your child?!! Your baby. The tiny, little person that you and your partner created and that lived inside of you for the better part of a year. There is a charge for you to hold that person? ?